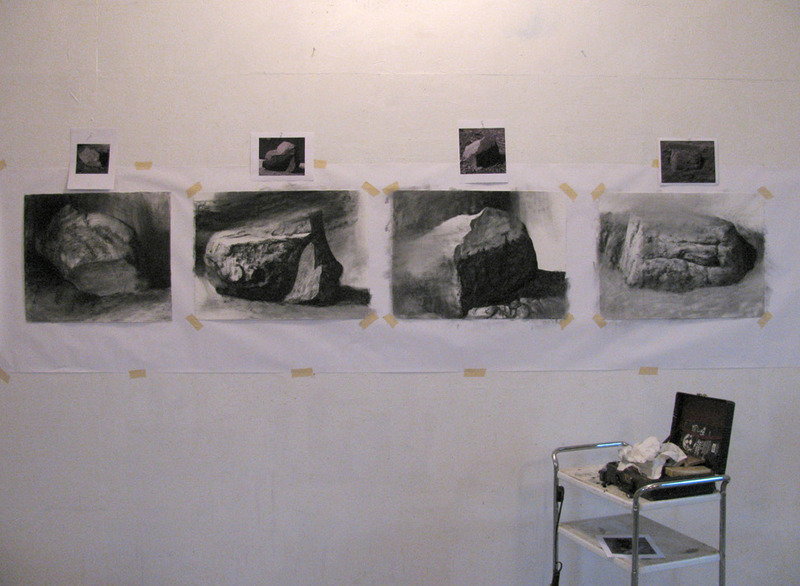 Charcoal on paper, each sheet approx. 22" x 30"
No daily painting today. The day was spent with rocks in my head, working on these drawings that continue the "Heaven and Earth" theme. I begin with photos of actual stones which are then "re-invented," freely interpreted with paint or drawing media. The search is for more than just a picture of a rock. I struggle for a poetic equivalent...some kind of felt reality, I guess. It seems impossible to describe this intuitive process in words. It is often frustrating, not knowing what I want until I see it, but I do love working in this open-ended way. The "Heaven and Earth" exhibit continues through September 10th in the Memorial Building at Whitman College, Walla Walla, Washington. If you go, use the back entrance--they have the front of the building blocked while doing construction/maintenance. Hi David--thank you, it means a lot coming from you! Stunningly bold drawings. I especially like the ultra sharp value contrast with other areas left blurry. Feels hyper-realistic. Modern and timeless. Silvina, I value your thoughts--thank you. Very cool seeing all these being worked upon at the same time! Thanks, Dean. There's something I like about having a group going at once and moving from one to another. Thanks, Leah--nice to hear from you.